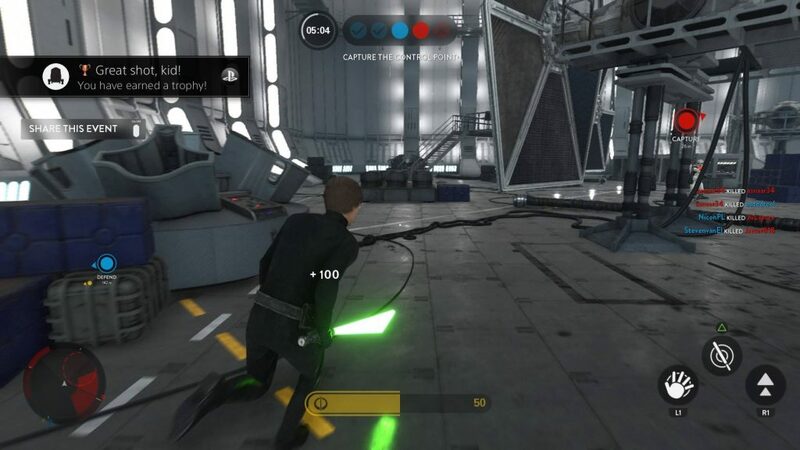 Star Wars Battlefront consists of short bursts of exciting conflict, leading to a speedy, untimely death, followed by reincarnation and a quick jog back into the action for more punishment and – less likely – glory. The foolhardy experience can be best compared to the death montage from Edge of Tomorrow in which Tom Cruise finds himself caught in the same fatal battle over and over again. It being an online multiplayer game, it was a new dynamic for me. I had never played the original nor any of the other online games in which two large teams of mostly strangers decide to virtually off each other to reach an abritrary goal. 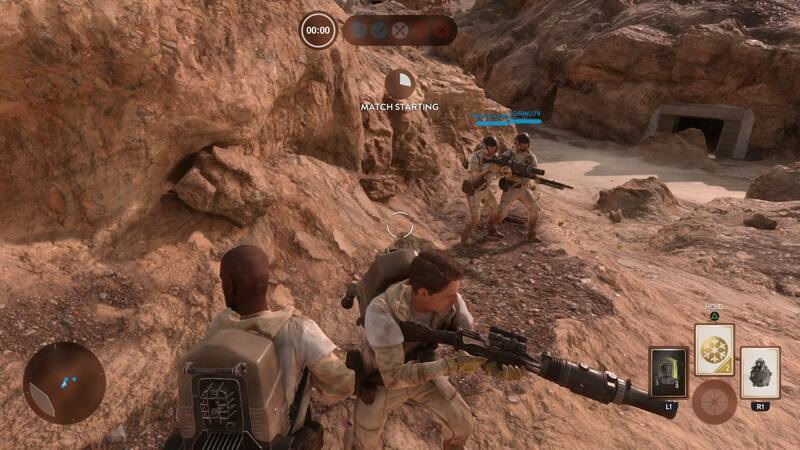 Star Wars Battlefront offers up a few different kinds of matches, some between two groups of 20 and some between two smaller groups. In most you have to defend locations within an arena and/or conquer them, depending on your role during a match. 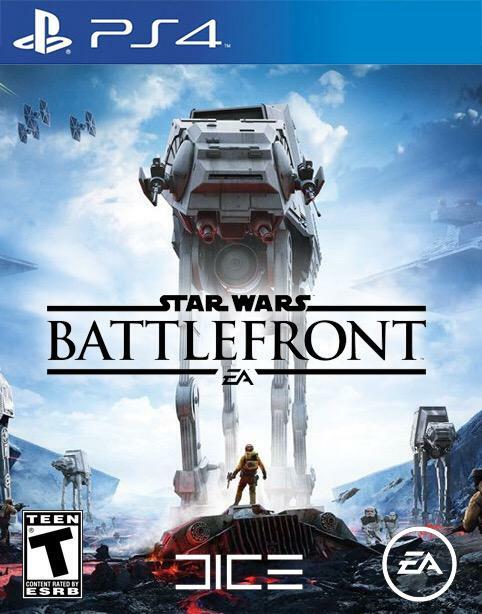 You will switch between playing on the side of the Rebel Alliance and the the Evil Empire. During some of the game modes, this will not make much of a difference, but during others it will change what you are trying to do. 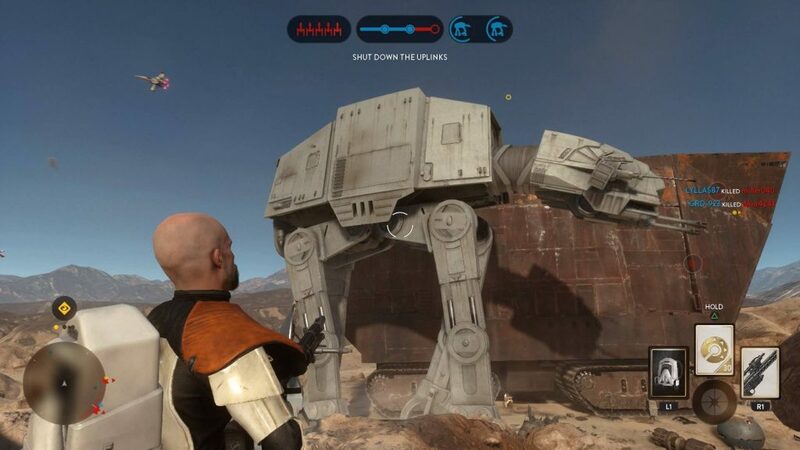 In ‘Walker Assault’, for instance, as an Imperial you will try to protect two giant Walkers as they trudge towards their target. When playing as a Rebel, you will have to try to take them down. I had been actively avoiding online slaughterfests, being full of prejudice about the gaming community. I pictured the other faceless gamers as socially inept teenagers, compensating for lack of power offline by bullying others online. 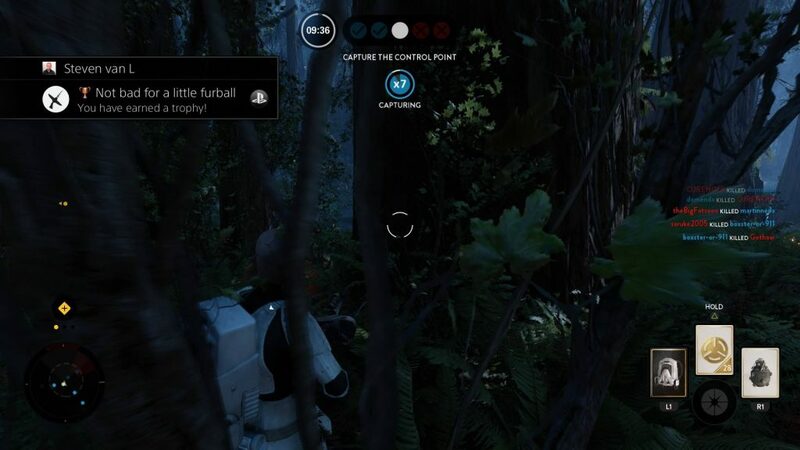 I was pleasantly surprised that verbal abuse was non-existent in Battlefront, but then that was possibly just due to there being no in-g ame chat. So there was simply no way for someone to call into question the nobility of my heritage or the virtue of my mom. 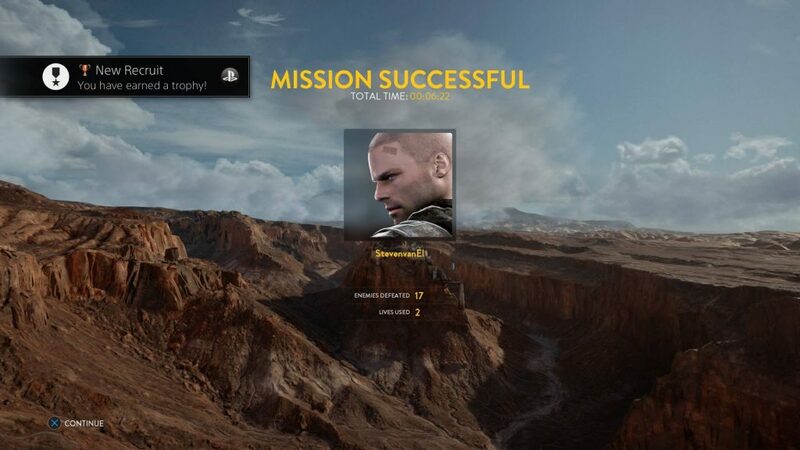 The game does show you who killed you and shows you their gamer-tag, but at least by default, you won’t see them marked when you run back into the action, so you can’t really target them for revenge. There may be a way to switch that on, but picking on a particular gamer never appealed, so I did not try to find it. If someone did at some point try to start a feud, I completely missed it. The downside of there being no chat is that you also can’t chat with any friends who may be in the same match. You can arrange this outside of the game, as I understand, and I did see some instances where it certainly seemed a group of soldiers was coordinating rather than just running around. So as a solo player you could theoretically be at a disadvantage, but with 40 people dying and reincarnating all over the place in a wide area, you can only try to steer chaos somewhat in your favor in any case. My interest in Star Wars Battlefront had its ups and downs. Initially, I was impressed by how good the game looks and sounds. While I am nowhere near the Star Wars fan I was as a kid, there was something pleasingly nostalgic about running through familiar locations, firing with blasters that made authentic ‘pew, pew’ sounds. But there was a wall in that I had no idea what was going on, which led to plenty of demises within a short time-span as more experienced players stomped all over me. 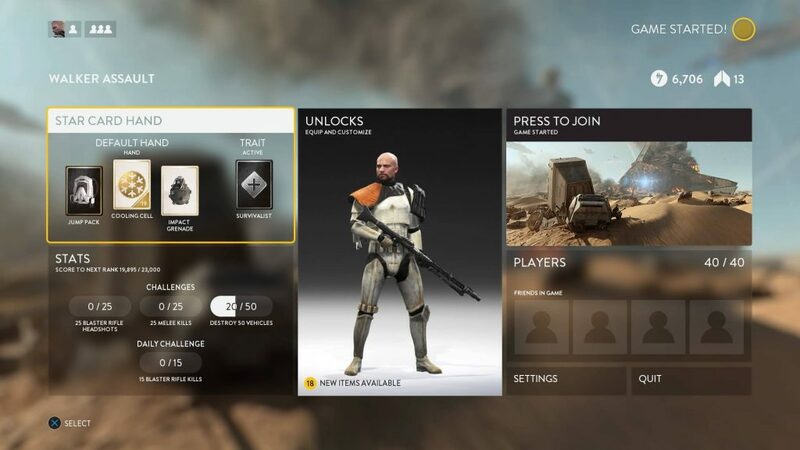 As you play more of Battlefront, you level up, which allows you access to certain new weapons and gear. The maximum level you can reach is 100 and I was surprised to see that a lot of players of that level were in the game with me, a complete newbie. These level 100 players had spent a ridiculous amount of time playing the various matches and knew of all the tricks and exploits. You would expect those players to mostly be put in games with players of the same level, to avoid an unfair advantage, but no. So what did I do to get over the discouragement? I kinda legally cheated. By which I mean I paid EA – the company behind the game – a small amount of real money to unlock a selection of the gear early, specifically the jetpack. Usually, when you croak, you respawn a fair bit away from the center of the action, requiring you to run back each time. Boring and time-sucking. With the jetpack, the downtime diminishes considerably, and it also cuts down on the demises, as you can often fly out of the way if someone has a lock on you. Depressingly, this caving to the bad business of in-game purchases was totally worth it and made sticking with Battlefront enjoyable. I think gamers can be divided into the groups ‘more time than money’ and ‘more money than time’. Most young players will fit into the first group, most people with jobs in the second. I can see why players would scoff at a monetary shortcut and I agree that it sends the wrong message to EA. 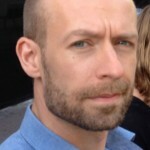 Making you buy a game and then essentially saying ‘Want to get to the good stuff sooner? Pay us more.’ feels icky. But I bought the main game on sale, and even with this bit of DLC it was still a good deal. So I gave in to The Dark Side and never looked back. I started to enjoy the game and got better at it, sometimes even taking out an amount of players equal to the amount of deaths doled out to me. There was fun in trying to make a contribution during a match and cooperating wordlessly with people on the same team, watching their backs. Especially in the 40 player matches barely controlled chaos reigns, so the results of your actions can be hard to gauge. I was unlocking new toys and trying them out but discovered that for understandable reasons of balance, each gun or item had a weakness equal to its strength. So nothing was intrinsically ‘better’, at least not by much. That is how it should be, as otherwise advanced players would wipe beginners off the map with their better gear. But when I realised that, the idea of progression started to feel empty. Once you have a selection of gear that works well with your playstyle, you may as well stick with it. But if you just stick to your guns, so to speak, you start to realise that the gameplay is fairly repetitive and that the amount of environments and the assortment of interesting matches is actually limited. Especially since some of the 6 versus 6 matches feel unplayable as a noob because experienced players easily dominate. EA being business-minded, it’s no surprise that you can buy a season-pass that adds environments and items, to be released over the coming year. But these are sold for such a high price that you’re pretty much buying a second game. By the time the price goes down to sane levels, I am sure the level 100 players will have memorised every inch of every new map already. I’ll likely still do the occasional match over the coming months, but I agree with the sentiment I encountered online saying that Battlefront doesn’t seem to have much staying power. Being new to these kind of games, in part the problem is me. I don’t feel like investing the kind of time needed to perfect my skills, trying to catch up with those who practically live in the game and seem to enjoy that. So I will always find myself at a disadvantage in a small selection of repetitive matches with little sense of progress. 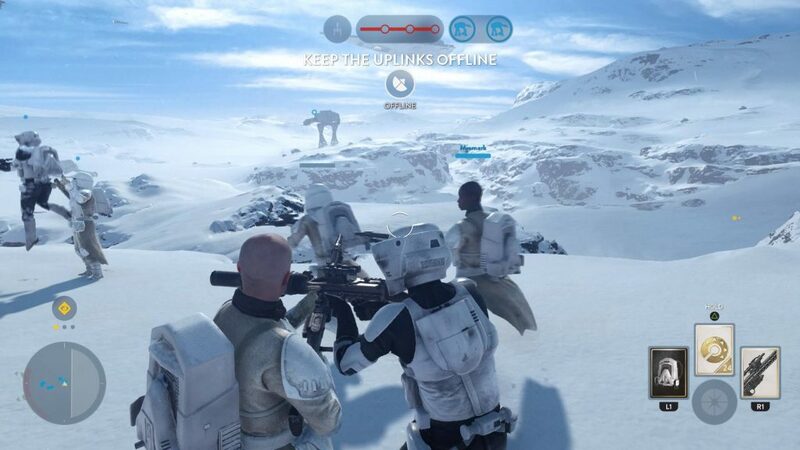 Battlefront has made me curious about similar kinds of experiences through. So I guess I should fire up Left 4 Dead 2 or Team Fortress 2 and have a look.